K & H Mfg Outdoor Unheated Kitty House Barn Red/Black 18" x 22" x 17"
The K & H Mfg Outdoor Kitty House is lightweight and easy to assemble, it's also strong. A unique design and water-resistant 600 denier nylon allow it to withstand snow and help protect cats from brutal winter weather. The zip-on roof hangs over the 2 doors to keep cats warm, safe and dry. Front and rear door door flaps provide added shelter while allowing cats to enter and exit the house. These lightweight, clear flaps attach to the inside of the house and can be pushed open easily. While the Outdoor Kitty House is lightweight and easy to assemble, it's also strong. A unique design and water-resistant 600 denier nylon allow it to withstand snow and help protect cats from brutal winter weather. 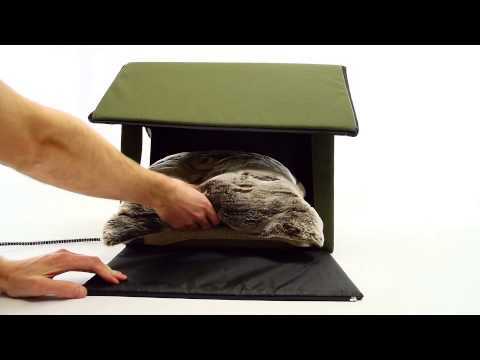 The zip-on roof hangs over the 2 doors to keep cats warm, safe and dry.